San Jose runners will be hit with a tsunami of color on September 14, 2013 at the Color Me Rad 5K. Runners wear all-white clothing through the Santa Clara County Fairgrounds, while being hit with color throughout the course until their face, shirt and body cross the finish line, covered in colored dust. Color Me Rad holds races across the US and Canada in more than 20 cities. 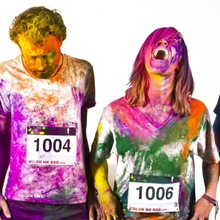 The San Jose race is the fifteenth stop on Color Me Radâ€™s nation-wide tour, which was created by four friends. Shifts of 1,000 people will take off every five minutes beginning at 9 a.m. Participants of all ages are welcome to run or walk. Registration is available at colormerad.com. The color dust is made with colored cornstarch that washes off. A portion of the proceeds of the race goes to Pacific Autism Center for Education.